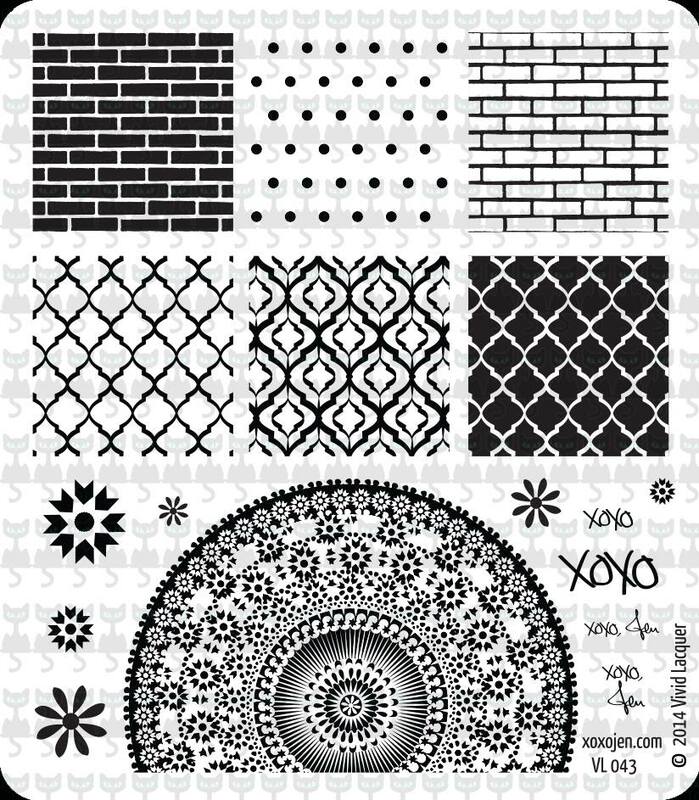 xoxo, Jen: I designed a stamping plate! I designed a stamping plate! I've been working with Anni of Vivid Lacquer to create a custom stamping plate with designs that I've longed for. The project has been in the works for a few months and I am excited to share it with you. I couldn't have asked for a better person to work with. Anni was patient as I changed my mind a few times throughout the process. I love each and every design that Anni drew for the plate, yes, she sketches out each image by hand and then scans them into Illustrator to perfect them. It's such a magical plate, plus....it even has my signature and logo on it! The first design that came to mind was a brick wall pattern. I have another plate with a similar pattern but the lines on it were as big as the bricks. I wanted one where the image was more proportional and realistic. Next was polka dots. I see utterly beautiful manicures done up with a tiny dotting tool, so precisely. I'm not that skilled and really wanted a tiny dot design with good spacing in between. I've always loved the patterns of tile and tapestries from Morocco so I requested a quatrefoil and double quatrefoil and of course, one of those tile mosaics they are so famous for. Anni also pulled some of the design elements from the tile pattern to use singly - clever! I don't yet have it in my hands as the physical plate just arrived to Anni from the manufacturer this weekend and is launching tomorrow at Vivid Lacquer's Etsy shop. So cool! Def adding to my list for tomorrow. Thanks and yay! So glad you like it! How exciting! I love your designs! Definitely awesome to have your own plate designed. Love the double quatrefoils and the tile mosaics! Yes, it felt like a dream! and Thank you! Congrats, and it's really beautiful! Thank you Jammies! It's great to hear from you, long time! Bought it off Etsy just a bit ago! Love the quatrefoil designs and dots! Yay! I'm glad you love it!